F9: This spacious one bedroom condo which includes a fireplace is only steps from the slopes. E9: Spacious and close to the action. Just steps away from the slopes, the outdoor grill, hot tub, and recreation room! 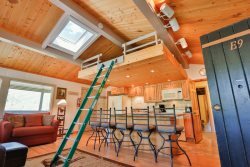 From the rustic wooden ceiling to the granite kitchen countertops, this condo will leave you relaxed and ready for your next family adventure! The fireplace adds to the ambience. Ski in or ski out from the deck just outside this one bedroom condo or enjoy the view of the Sunlight Mountain Resort from inside! F9 is conveniently located just one level up from the lower parking lot. 31 Days or More Prior to Check-In Date: $50 cancellation fee per condo, with remainder of deposit refunded. Groups & Peak Season Dates: Apply 61 days or more prior to check-in date. 30-15 Days Prior to Check-In Date: 50% of lodging cost total per condo not refunded. Groups & Peak Season Dates: Apply 60-31 days prior to check-in date. 14 Days or Fewer Prior to Check–in Date: No refund. Groups & Peak Season Dates: Apply 30 days or fewer prior to check-in date. Check-In: 4 P.M. MT. Early Check-In, if available, from 1 P.M. - Add $30. Check-Out: 10 A.M. MT. Late Check-Out, if available, by 1 P.M. Add $30. Two (2) night minimum. Three (3) night minimum for Winter Holiday unless condos are still available December 1. Then, two (2) night minimum. Rates based on four (4) occupants for Studios and six (6) occupants for One Bedroom and G condos. Additional occupants will be charged $10 each per night. Tax not included in nightly rates. We charge only the required state and county tax. All properties are non-smoking. A fine will be assessed if in violation. Pets are not allowed. A fine will be assessed if in violation.